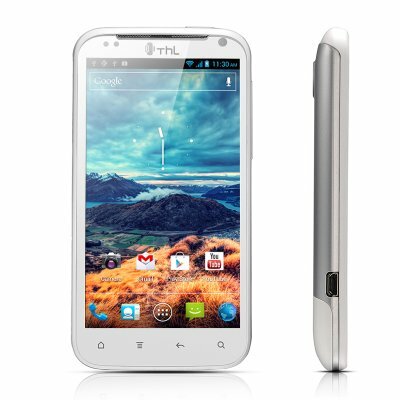 Successfully Added 320DPI HD Android 4.0 Phone "ThL W3+" - 4.5 Inch Screen, 1GHz Dual Core CPU (White) to your Shopping Cart. ThL has more than 10 years of experience manufacturing Android phones and has established a worldwide customer base. The ThL W3+ is a powerful high-end Android 4.0 phone packing an incredibly fast Dual Core CPU clocking at 1 GHz and can take on any task you throw at it, at the speed of light. Combine this with 1GB of RAM and you get a tablet with very solid specs! With a resolution of 1280x720 and 320 DPI (Dots Per Inch), this Super HD screen is one of the best screen available and you’ll be able to watch high definition movies the way they are meant to be viewed. Even the highest end Android phones from the most famous brands have 320DPI screen density! Running Android 4.0 Ice Cream Sandwich, the ThL W3+ has one of Android’s most advanced operating systems. Not only is Android 4.0 fast, but it also gives you a high level of customization options and a big app store with more than 600,000 Apps. Install any app, from YouTube over Facebook and Angry birds to Twitter and the ThL W3+ will run it with ease. Snap a picture with the 8MP camera, save it on the 4GB of internal memory or on a Micro SD card of up to 32GB and enjoy the deep saturated colors on the Super HD screen. on 2013-02-19 05:06:18 El telefono muy bueno, Chinavasion, mejor. Pues eso, el telefono como dice la publicidad de Chinavasion, perfecto. la rapidez en el servio por parte de Chinavasion, superrapido, en este aspecto cinco estrellas.Gracias y mucha suerte. on 2013-01-09 00:00:24 This phone is fantastic !!! This phone is fantastic !!! I have it about 15 days (the black one). The screen is brilliant!!! It is bright, vibrant and most importantly the viewing angle is fantastic. It's very fast, I have about 150 apps with no problem, no freezes. The battery life is very good, more than one and a half day on a single charge (with 2 facebook accounts, 2 twitter accounts and 5 Gmails running in the background, wifi or 3g). It is as loud and it does not distort under full volume. The phone generally feels solid and does not in anyway feels cheap.